It’s another wonderful time of year, and the big gift day has just passed for us in Norway. See, over here, “Santa” comes along on the night of the 23rd, and we open our presents on the evening (or late afternoon) on the 24th, ie. on Christmas Eve. Among this year’s “loot” there were several things that were on my wish list, and several others that weren’t, but were still appreciated. The most important thing for me, though, is family togetherness, and I believe we had that covered (although one of my sisters spent this Christmas with her boyfriend’s family in Sweden – they’ve started doing that every other year). As I mentioned in my previous post, I don’t really care about the price of my gifts, as long as I get something from those I love and care about. It could be as simple as something they made themselves, or all the way up to something big on my wish list. No matter what, even the smallest gift shows that they care about me back. So, what exactly did I get? On DVD, I got season 8 of CSI, Iron Man 2 and Toy Story 3. No big surprises there, as they were all on my wish list. So was the new pair of slippers I also got (seen at the back in the above photo). The rest wasn’t on my wish list, but nonetheless very appreciated. In book form, I got “Guinness World Records 2011”, “Nostalgisk ordbok” (a “dictionary” of words that we “old” people have often used, but are no longer in the vocabulary of the latest generation) and “30” (a book of quotes and “definitions” of things you do when you’ve crossed that magical line of becoming 30 years old). 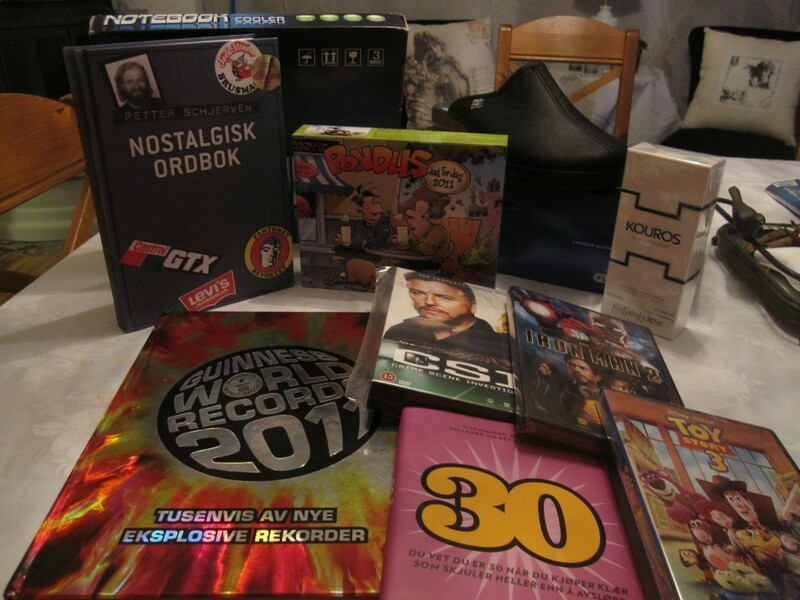 I also got a Pondus (a Norwegian comic strip) calendar, some exclusive body and hair wash (“Kourus” by Yves Saint Laurent) and a notebook cooler board (you know, something to place my laptop on to keep it chilled). Come to think of it, my laptop does seem to run a little hotter when I bring it to work, so I believe I’ll use it there (it was also a gift from someone I’ve worked closely with since I started at this company 7 years ago – I know, it kinda jumped me by surprise as well). So, if you celebrate it, what did you get for Christmas? Feel free to leave it the comments below (as long as it lasts). Now we’ll just enjoy a couple of days of rest and extra slow living, gearing up for our “romjul” (Boxing Week) celebration with a larger part of the family. Posted on 25.12.2010 at 17:40, categorized as blog.